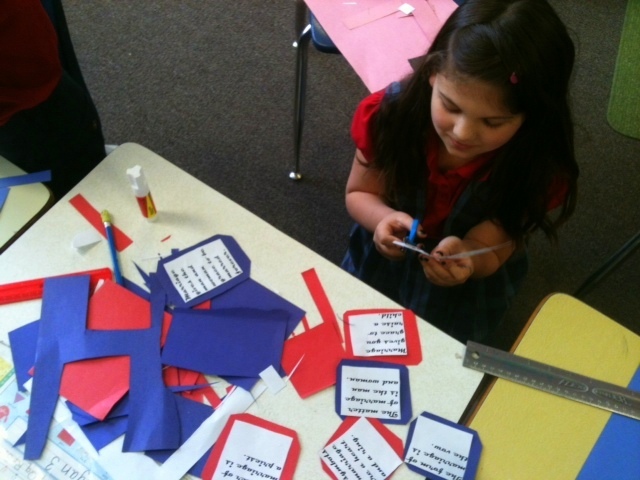 This week, we worked on making posters to accompany the Faith Fair dioramas that students are working on at home. One of the skills students are working to master is to create a visually appealing/ organized poster board. The text elements of the board were typed in the computer lab and then mounted on colored paper. These were then placed on a poster board. To come see the projects from all grades, come to the Faith Fair Tuesday night at 6pm. 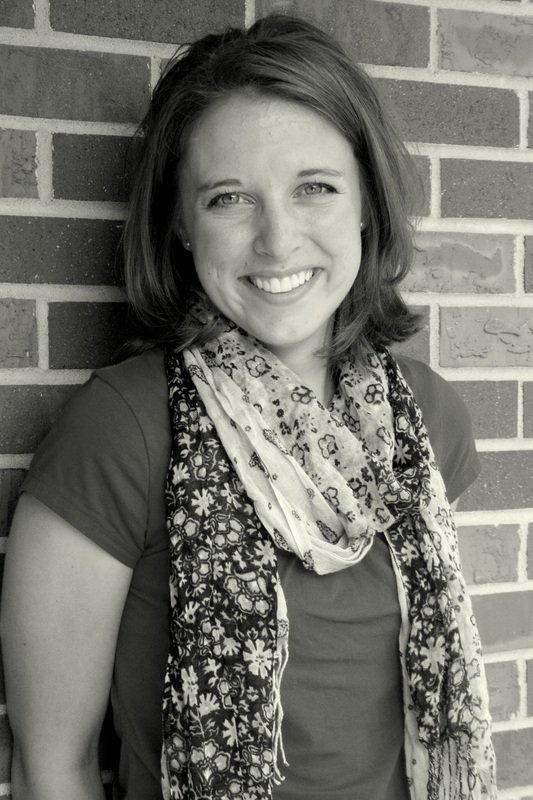 Projects will be open for viewing from 6-6:30 followed by Praise and Worship from 6:30-7. See you there! 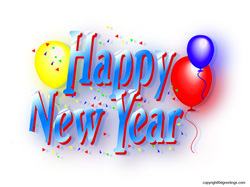 The new year is upon us! There are lots of new things to look forward to in the month of January for 2nd grade! This month we will be learning to subtraction three digit numbers. We will also complete our unit on counting money. In writing, we will be writing informational pieces and our religion lesson will be focusing on the sacraments. It should be a great month! Be on the lookout for this week's newsletter! We will have a few changes to our spelling and reading homework routine this semester! Last week, thanks to some wonderful parents the students had a fabulous All Hallow's Eve party! 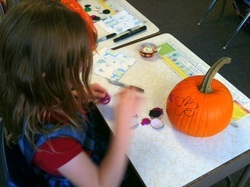 They drew on pumpkins and enjoyed some delicious treats! iPads, Web Design, and Saint Poster! 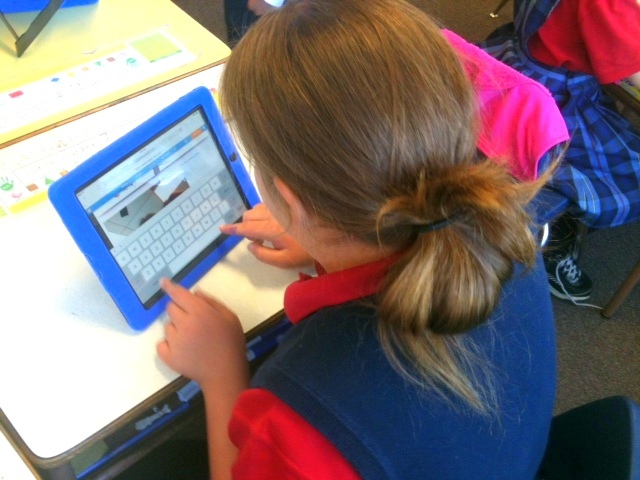 This week, we worked on our class webpages (to be shown at conferences!). The children used the ipads to upload a photo and write a short caption! Fun! 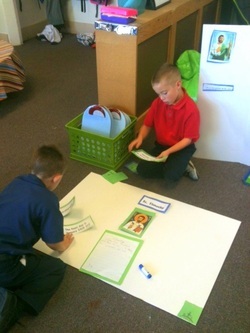 We also worked a lot on our saint projects. Students learned to make a poster board that follows a color scheme and is balanced! All in all it was a great week! 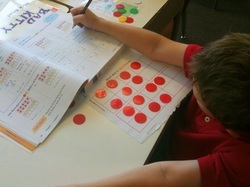 Two-Digit Addition and Blend Fun! This week, students used base ten blocks to model adding two digit numbers. We used tens and ones to familiarize with the word "regrouping"- formerly know to the world as "carrying". We also worked on words with the ai and ay spelling. In reading, we practiced sequencing the main events of a text. The big news of the week is that we've begun to learn cursive! This week we learned to make the letters i, t, u, and w! How fun! Story problems can be tough, but we're working on strategies to identify important information to help us solve even the most challenging problems! A pic from last week! Previously we worked on blends. Last Friday, we worked on making words with blends with our "blended" smoothie drink! A tasty way to end a week-long spelling unit! This October, we have a lot to look forward to in second grade. Students will be participating in a book study over the text "The Doll People". We will also be writing an informational report on saints and putting on a living museum. Towards the end of the month we will start writing persuasive pieces about spiders! It's going to be a fun month, full of learning and fun projects! This week, I decided to start doing book orders for our classroom. 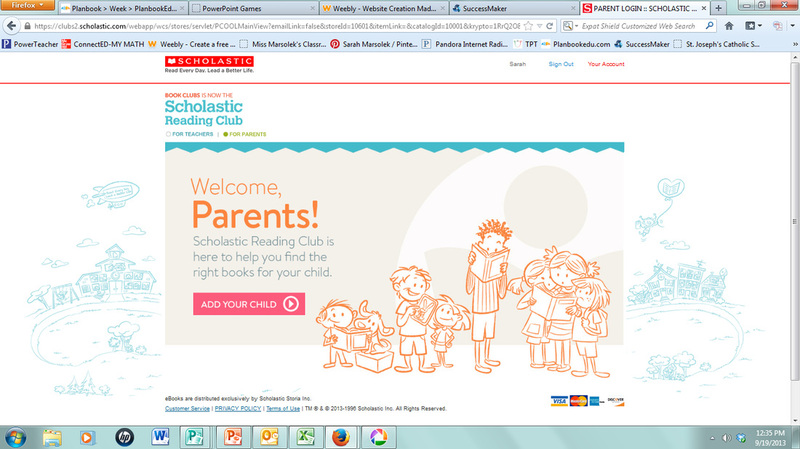 Parents will be able to go online and order books for their children, these orders help us earn points to order books for our classroom library. If you are interested in ordering books, a flyer is coming home with the activation code for you to order online, and your order to be linked to our classroom. Please make all orders online, and do not send checks to school. This will make ordering easier all around. If you have any questions, please feel free to send me an email. Below you will find a screen shot of the screen you'll be looking for when you go to order books! Happy Reading! Fun and fabulous! Those are two words to describe our new classroom furniture. 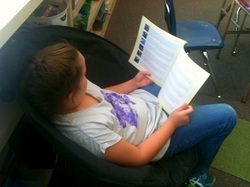 This week, we added three new comfy chairs to our classroom furnishing! They have been awesome places to read a good story or work on an independent worksheet! This week, we worked on related facts in math. Children had to problem solve to use the numbers in a fact family to solve word problems. It was challenging, but lots of fun! In reading, we worked on main idea. 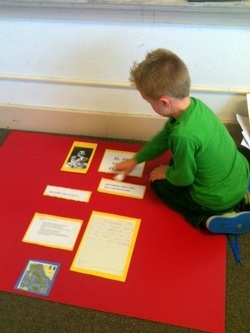 Students learned a song to help them identify the most important part of a nonfiction text. 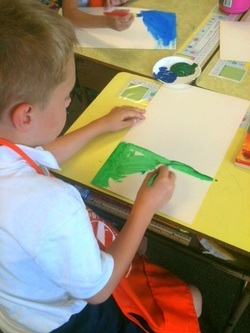 As usual, we enjoyed multisensory spelling, time on XtraMath.com, and our Friday art project! All in all a great week, with only more fun to come! Be sure to check out SpellingCity.com under Computer Activities to start practicing next week's words! Also, the link to XtraMath is posted as well! Week 2 - So much to do! This week has been a busy one for the second graders as they settle into the routines of school. We've been working hard to learn strategies for addition. These include making ten and counting on. In reading, we are focused largely on short vowel sounds and phonemic awareness activities to distinguish the sounds. We took our liturgical year assessment today, and the children demonstrated that they truly understood what each color of the church year means! Go ahead and ask them! They're rock stars!